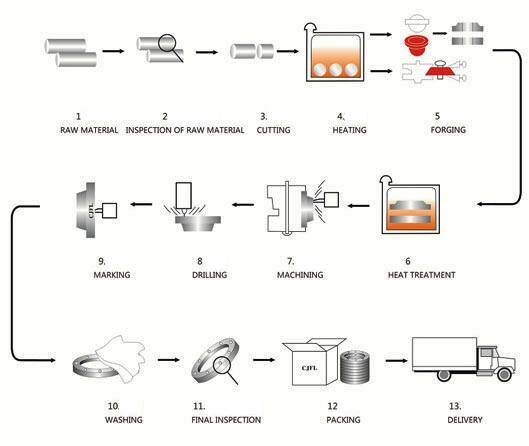 What are The Main Flanges Manufacturing Processes? Beginning with this process, the system controls the quality of all incoming materials as per the raw material test certificate of the material. Checking in each size for chemical and physical properties of these materials at Government approved laboratory. At the raw material stage, the same is checked visually for any kind of surface defects such as cracks, seams, overlapping, pitting, as well as dimensionally. A chemical & physical test is carried out before selecting the Raw material. After acceptance of raw material, a control number is issued and this is punched/marked on the whole of the Raw material is to use. In manufacturing of flanges. At the time of cutting, The control number is transferred on each cut pieces and the same is transferred after every operation of forging or forming in the case of Invisibility of the same. After each forging or Forming process, the material is checked visually for surface crack. Heat treatment is carried out after final forging or forming as required by the code. After final forging or heat treatment, a batch number is assigned to a lot and this batch number is stamped on each flanges. and on the temperature chart which is automatically generated by temperature recorder coupled with the heating furnace. Time of final forging/forming & date is also mentioned on the chart. After final forging/forming and Heat treatment process, all the flanges. are sent for machining i.e. and preparation, O/D and I/D matching as per dimensional codes. An Expert Q.C. engineer is involved and he keeps a constant vigil on every machining operation. Step machining is carried out as required by the codes. GO and NO-GO gauges are used to check the O/D & I/D of the fittings, Flanges, Etc. The tensile test is done on a sample taken from mother Raw material or from the lots of flanges. in accordance with codes as required by the purchaser on a universal testing machine which is calibrated & approved by the authorized inspection agencies. Hardness testing is done on At least 10% of each lot & results are recorded in the separate register. 100% X-Ray examination is carried out on all flanges. All Steel flanges, are pickled and passivated by pickling all the scale is removed which is formed during forging/ Forming operations. After pickling, Grinding operation is done to remove the die mark and inside / outside burrs formed during forming & machining operation. Dimensional check is carried out finally & recorded. After the final dimensional check each fitting is stamped /marked for size, schedule, Fittings specification, Heat mark & batch number. All steel flanges must be packed with seaworthy packing method then delivery to customers, usually the packing way include wooden box, wooden pallet, iron & steel cage, iron & steel pallet etc. Because of the normal wooden boxes or wooden pallets have to do fumigation treatment, we usually use plywood pallet or plywood case or box to pack steel flanges without fumigation treatment. Whatever plywood or iron & steel packing way, they must be seaworthy, strong, waterproof and easy for loading and unloading. The final process of dispatch is the most tedious of all, and heavy duty cranes are used for it. With the help of our extensive delivery chain we can ensure time critical deliveries at the behest of our esteemed clients. We are indeed privileged to be able to serve and live upto their expectations and occupy unparalleled postion of Flange makers in India.